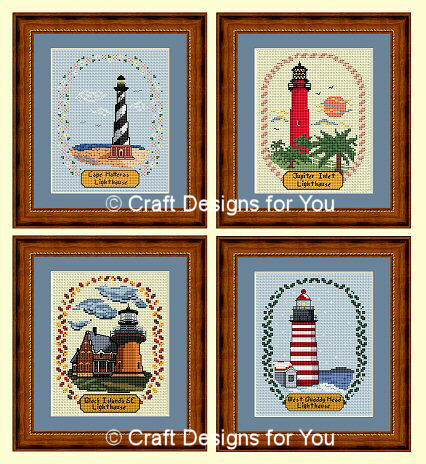 Stitch this Beautiful Collection of Seasonal Lighthouses in Cross Stitch! Includes North Carolina's Cape Hatteras Lighthouse for Spring, Florida's Jupiter Inlet Lighthouse for Summer, Rhode Island's Block Head Island Lighthouse for Autumn, and Maine's West Quoddy Lighthouse for Winter. Stitch these beautiful scenes on 14-Count Light Blue and Ivory Aida with DMC Floss. Fits standard 5x7 or 8x10 frames. Click Here to see these patterns in Plastic Canvas.